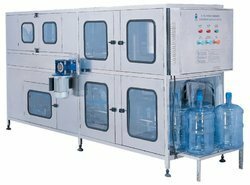 Pioneers in the industry, we offer semi automatic jar filling machine, jar filling machine, semi automatic jar washing machine and automatic jar washing machine from India. Semi automatic jar filling machine fill 60 jar in one hour, it is very easy to operate Owing to our expertise in this field, we are affianced in offering Fully Automatic Jar Rinsing Filling Capping Machine which is sturdily constructed & corrosion proof. This machine is developed using optimum quality components and advanced methodology. Also, our offered machine finds wide application in liquid packaging industries and grain packaging industries. Offered machine is available in the market in varied specifications. Jar Filling Machine is useful for those who is doing bulk production in 20 liter bottles. 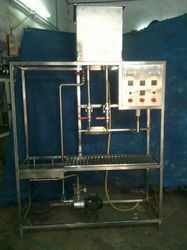 we are providing fully automatic 20 liter jar washing filling and capping machine. we can produce up to 120 to 240 Jar per hours. 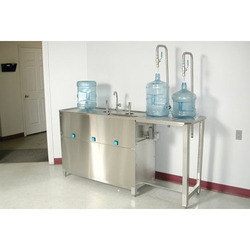 Our clients can avail a large assortment of Jar Filling Machine from us. Engineered with precision using latest equipment available in our designing and manufacturing area, these products have won appreciations for their automatic functionality, efficiency and rigid construction. Stringently quality tested to ensure zero defects and functional error we customize these products as per international standards respecting all values of engineering. We are offering Semi Automatic Jar Filling Machine to our clients.Owing to our expertise in this field, we are affianced in offering Fully Automatic Jar Rinsing Filling Capping Machine which is sturdily constructed & corrosion proof. This machine is developed using optimum quality components and advanced methodology. Also, our offered machine finds wide application in liquid packaging industries and grain packaging industries. Offered machine is available in the market in varied specifications. 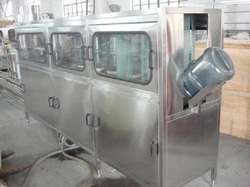 We are offering Semi Automatic Jar Washing Machine to our clients.Semi Automatic Jar Washing Machine is usefull for those who is doing bulk production in 20 liter bottles. emi Automatic Jar Washing Machine offered can handle bottle height of 150-340MM and bottle diameter of Φ50-Φ120MM.